I have officially finished my maternity leave (give me just a minute to cry into my coffee). These last 8 months have entirely vanished into thin air – I can’t get over it. Today I ventured back to the office to do the work that I love with a team that I am grateful to get to work with. That helps doesn’t it? Going back to a job that you enjoy? It’s going to be such a change of head space but I feel like I’m ready. The last couple of months of parenting have been taxing to say the least. The baby just doesn’t sleep well and if I’m honest, I have found myself just barely keeping my head above water some days. I feel like it will be good for me to get some space to flex other mind muscles and for Ada to build on her attachments with her loving grandparents who will be taking care of her 3 days a week. Although there have been some real challenges to navigating two kids with a larger age gap (almost 5 years) the lovely thing has been that I have had such a concentrated time to really connect with both of them when they were babies. Because Levi is in school, Ada and I have most of the day together to hang out and it has been really nice to be able to do that and give her that attention. And nap when she naps. I will miss my nap in the morning so very much. She is a pretty content little one, happy to crawl about now, exploring all the corners of the room and chewing on everything put into her hand. 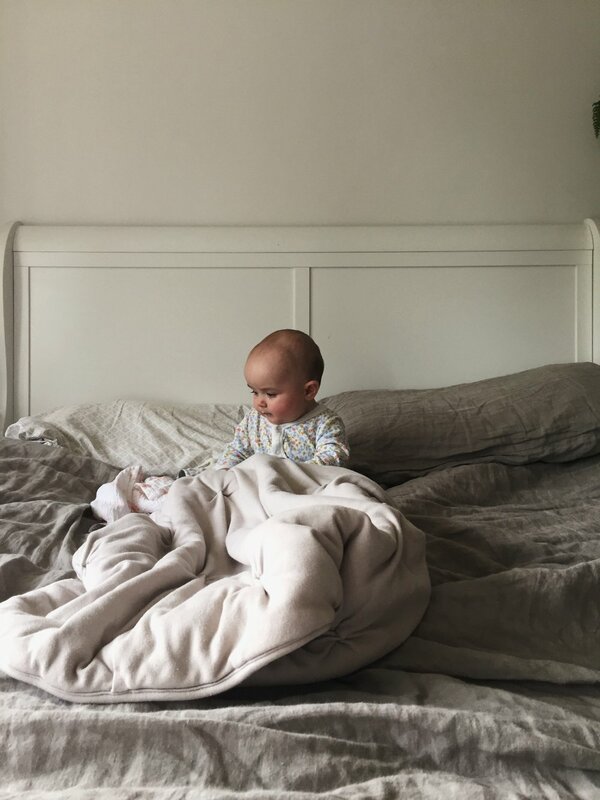 She is also a really observant baby, taking in everything around her – mostly watching in awe at the antics of her big brother – and she has the best reactions. I love this stage, when they start to really interact with you; copying, giggling, communicating in their own ways. I also love how proud Levi is to be her big brother – something that has take its time developing but now shines through and it melts me right down. Around the 4 month mark, I was starting to struggle with what we needed in order to give Ada somewhere to sit. She wasn’t quite ready for the highchair and with her curiosity blooming, we had exhausted the playmats and mobiles that kept her lying down. Dutch design brand Nuna kindly sent us their baby chair to try and I’ve been really grateful for it and impressed by it for lots of reasons. Ada has loved sitting in the Nuna Leaf since she was quite small and it has been a lifesaver for those moments when you just need to get stuff done – wash the dishes, change over a load of washing, make breakfast etc. (how domesticated do I sound?!) She is safely harnessed in (only now at 7 months taking an interest in the sturdy Velcro) and the gentle swaying motion seems to chill her right out – happy to gnaw on her toys while I hustle out some housework. With Levi having a playroom, I had forgotten how much baby stuff has the potential to take over your house. Except for his current lego projects, most of the toys live in our basement playroom. Some people are totally OK with a house full of toys, but I have always struggled. Lots of shiny plastic and noisy things mess with my mojo so as superficial as it may seem, I love that the Nuna Leaf is really slick (we chose the beautiful Navy colour but all of the colour choices are serene and gender neutral – big tick for me) and isn’t an eyesore in the home - we have the ever-savvy dutch design team at Nuna to thank for that! I think it’s a myth that babies need to have bright lights and colours to keep their interest – sometimes I think the gear available in the baby market is way too stimulating for little ones and I’m all about keeping it simple and letting their imaginations develop naturally. I mean, have you ever seen a baby pass up an opportunity to play with a packet of baby wipes? Nor me. They need less than you think. As with any of the products or brands that we bring into our home, I also love that Nuna is transparent and ethical in their supply chain and production. They use really superior materials that are certified across a variety of standards including organic fabrics (great for babies, great for the planet) and even their production factories are using renewable energy and extensive recycling waste management programmes. They have a whole easy-to-access section on their website about how they prioritise responsible production which shows me that they are proud to be making good ethical choices. A big gold star from me. 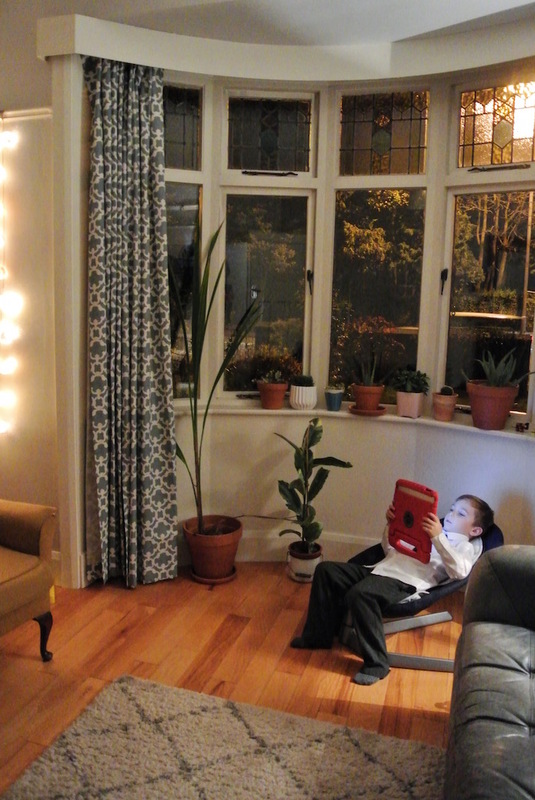 The other huge bonus to the Nuna Leaf is that it grows with the child and has a high (60 kilos) weight limit so even Levi loves lounging in it after school or when he has some ipad time. In the midst of so much newness and change for him it’s nice that this is something that can be shared and will get a lot of wear in the years to come. So on life goes, all good maternity leaves must come to an end and as the leaves fall and the air turns cold I think I’m ready for this new chapter of navigating work and home life. It has been a beautiful year of watching our family change and grow and I feel like this coming season, with the challenges I know will come, is one to be excited for. How did you feel about the end of maternity leave? Were you devastated? Ready? I’d love to hear how the transition went for you. With thanks to Nuna for sending me the Leaf to use and tell you all about! Despite getting lots of requests, I don't do a lot of reviews or sponsored content on this blog so you can be sure if I'm promoting something it's because I think it's worth talking about!